You will be able to Learn How to use Group FaceTime on iPhone XS. That You Must Check Out. Today we are here with Detail guide on Group FaceTime on iPhone Xs. As we all know, it’s not the hardware specs alone that define a phone. The software also plays an important role in making it a complete experience. Bring the group chat to life with Group FaceTime. To use FaceTime with more than one person, you’ll need a supported device running iOS 12.1 or later. UP to 32 friends. Start a new Group FaceTime. One way to start Group FaceTime is from Messages. Open Messages then open or start a message with the contact or group you’d like to call. Tap on the group name or contact at the top of the message. Then choose FaceTime from the drop-down menu. This will start a FaceTime call with everyone in the message. Each friend in the call will appear on screen in their own tile. As newcomers join, their FaceTime tiles will appear on the screen. The tile of the person speaking will get larger automatically, so you can easily keep up with the conversation. Tap the Animoji icon, and chose an Animoji or Memoji to bring to life. You can also add stickers, filters, and animated text effects. To leave the call tap the red X. The call will stay active until the last two people hang up. 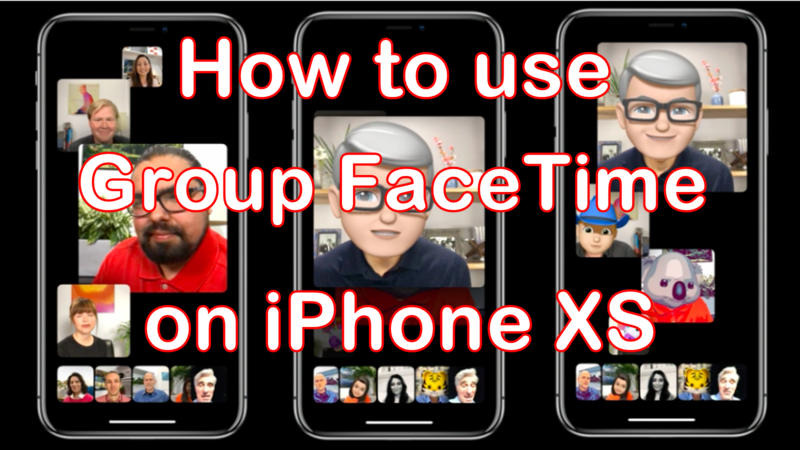 I hope you understand all tutorial on How to use Group FaceTime on iPhone XS Tips and Tricks. If you have any problem then ask in the comment box. We can solve your problem.